Impact Craters Are Craters Produced By Meteorite Strikes. Impact craters are found on the surface of a planet after a meteorite has crashed. Impact craters is a circular or oval depression on a surface, usually referring to a planet, moon, asteroid, or other celestial body, caused by a collision of a smaller body (meteor) with the surface. The Meteor Crater (Barringer Crater) is a prime example of an impact crater. Impact craters are also known as a(impact basin, astrobleme or sometimes crater). 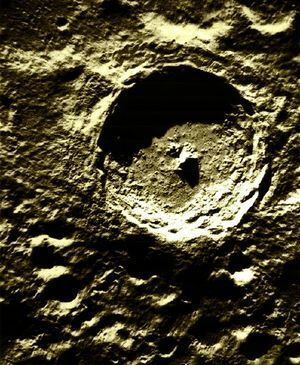 Tycho Impact crater on Earth's Moon. NASA photo. Ancient impact craters whose relief has disappeared leaving only a "ghost" of a crater are known as palimpsests. Although it might be assumed that a major impact on the Earth would leave behind absolutely unmistakable evidence, in fact the gradual processes that change the surface of the Earth tend to cover the effects of impacts. erosion by wind and water, deposits of wind-blown sand and water-carried sediment, and lava flows in due time tend to obscure or bury the craters left by impacts. Simple slumping of weak crustal material can also play a role, especially on outer solar system bodies such as Callisto which are covered in a crust of ice. Daniel Barringer (1860-1929) was one of the first to identify a geological structure as an impact crater, the Barringer meteorite Crater (or the "Meteor Crater") in Arizona, but at the time his ideas were not widely accepted, and when they were, there was no recognition of the fact that Earth impacts are common in geological terms. In the 1920s, the American geologist Walter H. Bucher studied a number of craters in the US. He concluded they had been created by some great explosive event, but believed they were the result of some massive volcanic eruption. However, in 1936, the geologists John D. Boon and Claude C. Albritton Jr. revisited Bucher's studies and concluded the craters he studied were probably formed by impacts. 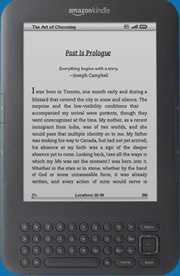 The issue remained more or less speculative until the 1960s. A number of researchers, most notably Eugene M. Shoemaker, conducted detailed studies of the craters that provided clear evidence that they had been created by impacts, identifying the shock-metamorphic effects uniquely associated with impacts, of which the most familiar is Shocked quartz. Armed with the knowledge of shock-metamorphic features, Carlyle S. Beals and colleagues at the Dominion Observatory, (Victoria, British Columbia, Canada), and Wolf von Engelhardt of the University of Tübingen in Germany began a methodical search for "impact structures". By 1970, they had tentatively identified more than 50. Their work remained controversial, but the American Apollo Moon landings, which were in progress at the time, provided evidence of the rate of impact cratering on the Moon. Processes of erosion on the Moon are minimal and so craters persist almost indefinitely. Since the Earth could be expected to have roughly the same cratering rate as the Moon, it became clear that the Earth had suffered far more impacts than could be seen by counting evident craters. The age of known impact craters on the Earth ranges from about a thousand (e.g. the Haviland crater in Kansas) to almost two billion years, though few older than 200 million years have been found, as geological processes tend to obliterate older ones. They are also selectively found in the stable interior regions of continents. Few underwater craters have been discovered because of the difficulty of surveying the sea floor; the rapid rate of change of the ocean bottom; and the subduction of the ocean floor into the Earth's interior by processes of plate tectonics. Current estimates of the rate of cratering on the Earth suggest that from one to three craters with a width greater than 20 kilometers are created every million years. This indicates that there are far more relatively young craters on the planet than have been discovered so far. Formation and structure of impact craters. Multi-ringed crater Valhalla on Jupiter's moon Callisto. 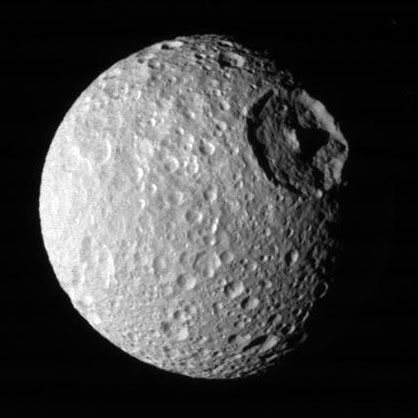 Herschel Crater on Saturn's moon Mimas. ALC - small, cup-shaped craters with a diameter of about 10 km or less, and no central floor. The archetype for this category is 'Albategnius C'. BIO - similar to an ALC, but with small, flat floors. Typical diameter is about 15 km. The lunar crater archetype is Biot. SOS - the interior floor is wide and flat, with no central peak. The inner walls are not terraced. The diameter is normally in the range of 15-25 km. The archetype is Sosigenes crater. TRI - these complex craters are large enough so that their inner walls have slumped to the floor. They can range in size from 15-50 km in diameter. The archetype crater is Triesnecker. TYC - these are larger than 50 km, with terraced inner walls and relatively flat floors. They frequently have large central peak formations. Tycho crater is the archetype for this class.